Police said that a female bomber was the only person killed in the blast. 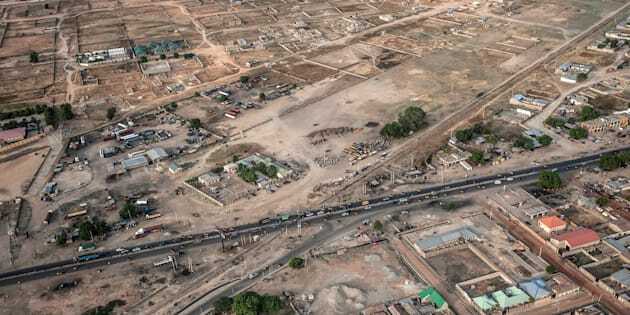 An aerial view taken on December 8, 2016 shows infrastructure and houses in Maiduguri, Borno State, northeastern Nigeria. MAIDUGURI, Nigeria, Dec 26 (Reuters) - A suicide bomber attacked a cattle market on Monday in Maiduguri in northeastern Nigeria, the city worst hit in the seven-year insurgency waged by Islamist militant group Boko Haram. The police said the female bomber, who struck the Kasuwan Shanu market in the central district of Kasuwa, was the only person killed in the blast at about 08:40 a.m. (0740 GMT). In a statement, police said a second woman who had a bomb was “lynched by an irate mob in the vicinity.” Security forces later detonated her device. Nobody has claimed responsibility for the attack but it bears the hallmarks of Boko Haram and comes days after President Muhammadu Buhari said the jihadist group’s key camp in its last remaining enclave had fallen. The Islamist militant group has killed 15,000 people and displaced more than two million during a seven-year insurgency to create an Islamic state governed by a harsh interpretation of sharia law in the northeast of Africa’s most populous nation.